Read what others are saying about the book! 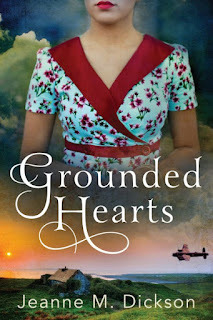 Grounded Hearts is just the book I was looking for having come off of watching My Mother and Other Strangers (WWII drama set in Ireland) on PBS this past week. I'm such a sucker for a WWII story and Grounded Hearts is one of the best I've read in the genre in a long while. Ms. Dickson paints Ireland with the brush of seasoned artist. I could feel the cool mud of the bog pulling at my feet and see the mist heavy in the air. Her eye for detail is clear in every line of prose. Nan, Dutch, and even Nan's furry friend, Mr. Dee are simply delightful. The chemistry is immediate and off the charts between conservative Catholic Nan and the wounded, but still brash, RAF pilot. I can't remember the last time I read a story with characters who were so fascinating. Even though Grounded Hearts is a romance, I still found myself really caring about the townsfolk and friends of Nan, too. That Dr. Mann has a big secret and I need to know more! Her story deserves to be told as well. I hope this isn't a one off book and that Jeanne chooses to take us readers to Ireland again soon! Fans of WWII stories, PBS drama, and romance alike will enjoy this vivid, and breathtaking historical from the pen of Jeanne Dickson. I know I'll be on the lookout for her next book. Hopefully, it's another marvelous historical!